Hello Friends,Every year over 100 million cameras are sold and about 10% of them are high-end cameras purchased by professional photographers and hobbiests alike. We hear a lot of stories regarding theft of these expensive devices and wanted to help. 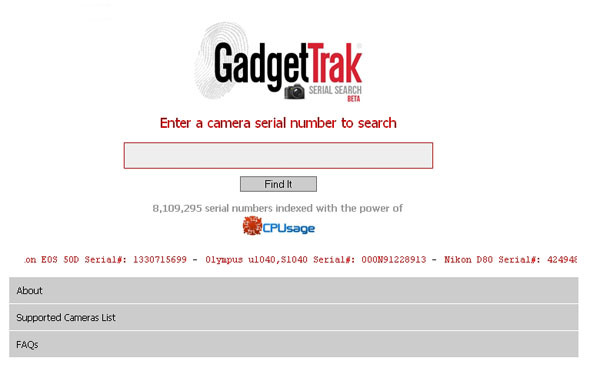 GadgetTrak Camera Serial Search, is a special search engine that let you search images online by entering the serial number of a camera and resulting any images found that were taken by that camera. Many of the images captured are uploaded to social media and photo sharing sites for public view. We found that many of the top camera manufacturers embed the camera’s serial number into the image. This includes Canon, Nikon, Kodak, Pentax and more. We scan online photo sites and extract this serial number using a specialized distributed computing engine that we have built. Digital cameras often stores camera’s serial number, as well as information on exposure, shutter speed, time and date taken and in some cases, where it was taken with photos. All these data are stored in the Exchangeable Image Format (EXIF) tags in the photo. GadgetTrak Camera Serial Search is very useful to find stolen cameras. If your camera is stolen and what to track who is using your camera then get your stolen camera serial number and search. If you see photos didn’t take by you, you’ll have a clue to who has your camera. If you see your photos on site without your permission to use them, you may be able to go after them for copyright infringement. Currently GadgetTrak only search images from a handful of popular photo sharing sites and does not support smart phone images. However, it is a Beta and will add more resources in future. It’s well worth checking out in the meantime, and it certainly does take the realm of search into a whole new different direction. like your technique of blogging. I book-marked it to my bookmark website list and will be checking back soon. there that I'm totally confused .. Any tips? Thanks a lot!